Although He will NOT be the last Death of the Civil War if @SPLCenter , Antifa, and the Left Get their way! 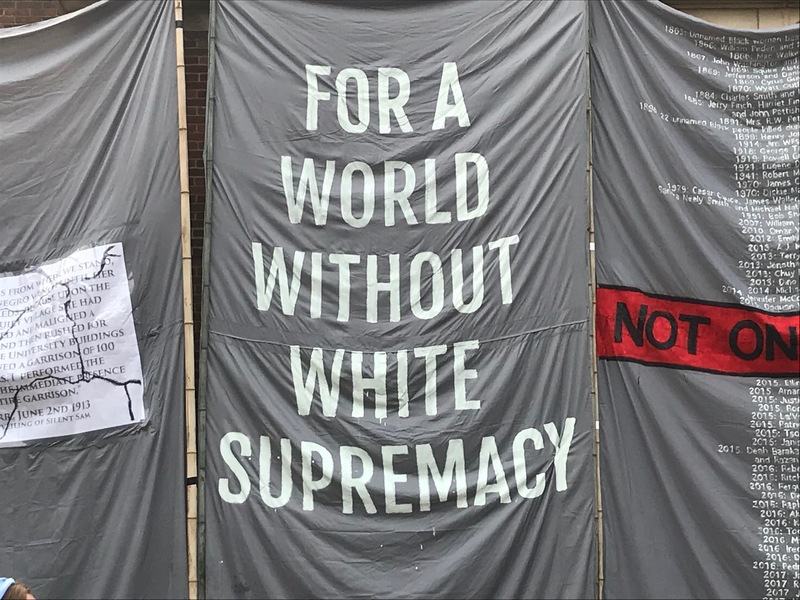 The event unfolded as students begin a new semester at UNC Tuesday, almost a year after a massive march against Silent Sam in the aftermath of violence in Charlottesville. The Silent Sam statue, erected in 1913, was built to honor Confederate soldiers in the Civil War. Protesters vowed to sustain the pressure on the university to relocate the Confederate monument, but campus and UNC system officials insisted a 2015 state law prevented them from doing so. At 9:15pm on Aug 20th 2018 the Civil War had another death, this time it was not of flesh and blood but as metal and stone. Silent Sam the Controversial Confederate statue on the campus of UNC-Chapel Hill fell and the blame is on lots of hands. Not only due to “Students” and Protesters, but domestic terrorist groups like Antifa as well as the failure of the police. Such as The Orange County Sheriff! His office had at least 2 hours, before the destruction, to get in there, quell the shenanigans, & enforce the LAW. He made a decision, NOT TO ACT! After the initial skirmish, town and university police officers took a hands off approach, standing a short distance away, keeping a watchful eye on the protest. After about two hours, many of the marchers headed to Franklin Street, followed by some of the officers. A core group of protesters stayed with the statue. So the Question is: Who gave the order for the police in Chapel Hill last night to stand down and let the mob act in anarchy!? Last night in chapel hill the few confederate supporters couldn’t stop the protesters. Cops formed a barrier around them hence allowing the destruction. -The right to deploy smoke canisters as part of your protest without police interference. UNC is and always has been a hotbed of Liberalism. According to the Raleigh News & Observer, the rally began as a gathering of support for UNC doctoral student Maya Little, who is facing criminal and honor-court charges for throwing ink and red blood on the statue in April. The downtown Franklin Street event quickly morphed into a march to the UNC campus, where police officers stood at the monument. Maya Little, the doctoral history student who had doused the statue with ink and her own blood in April, appeared and protesters chanted her name. She took the microphone and spoke of an African-American man, James Lewis Cates, who was stabbed by a white motorcycle gang on the UNC campus in the early 1970s. Little’s action in April, which she has said symbolized the “black blood” at the statue’s foundation, has become a rallying cry of those who oppose the Confederate monument on the UNC campus. Another graduate student, Jerry Wilson, said being a black man on UNC’s campus was a lonely experience. He read what he said was a letter he had written to UNC Chancellor Carol Folt. “When you have to take the long way between classes in order to avoid the sight of a statue that denies your human dignity, the Southern Part of Heaven can feel an awful lot like hell,” said Wilson, who studies education. He said the university had bowed to the wishes of donors and well-heeled leaders who wanted to see the statue stay at UNC. Wilson placed a rope, fashioned as a noose, around his neck and vowed to wear it until Silent Sam was gone. Hundreds of students, faculty members, and residents surrounded the monument, and were met with counter-protesters wearing Confederate flag shirts, some of whom were seen arguing. Several bystanders wearing Confederate flags on T-shirts watched the protest. Clint Procell, 31, wore a Trump hat. A self-described conservative, Procell said he wanted to see for himself how intolerant the people protesting Silent Sam were, and the experience didn’t disappoint. He said he was pushed and his hat was temporarily stolen. He described some of the protesters’ language as hateful against police and conservatives, but said he also had several conversations that were remarkably open. UNC has long tried to protect the statue, spending $390,000 on securing it last year. The university has cited state law in its refusal to remove Silent Sam; North Carolina, along with other Southern states, recently strengthened its laws protecting Confederate monuments. A skirmish broke out early when someone threw a smoke bomb. Police chased one man and arrested another for resisting, delaying and obstructing an officer. The protesters quickly took control of the area immediately around the statue, hoisting four tall banners in a square that almost completely obscured it. The head of the Confederate soldier occasionally poked out from the top of the banners. Earlier in the evening, protesters covered the statue with tall, gray banners, erecting “an alternative monument” that said, in part, “For a world without white supremacy.” Meanwhile under a cloak of this protest, the protesters were working behind the scenes of this covering with ropes while they secured their way to bring the statue down. Which is exactly what they did as only 2 hours into the rally and with a loud CLANG, Silent Sam was Silent No Longer, and then the crowd cheered at this act of violence. Student paper The Daily Tar Heel reported that the protesters used a rope to pull the statue to the ground, and that it came down around 9:20 p.m.
Then in a taunt there was a black cap on the statue that said “Do it Like Durham” which is a reference to how they made the confederate statue fall there a year ago. On a side note, forgive me if I don’t immediately take the street to record what happened up close as fast this year… still recovering from last years run in… and honestly I cannot bring you news if I am not in one piece. I'm going to a Durham GOP meeting tonight to ask questions as to why breaking the law is now tolerated just because something is offensive! I don't like the statue but the law was broken! When Silent Sam was pulled down, it sent people screaming and jumping in disbelief. Smoke bombs were set off around what was left of the monument. People rushed to the remains, taking photos and stomping on the monument that had been erected in 1913 with donations from the United Daughters of the Confederacy. The statue has been the focus of protests and vandalism for decades, but especially in the past year. UNC had installed surveillance cameras and spent $390,000 on security around the statue last year. Protestors knew the statue was under constant police surveillance, but they came prepared with banners that provided cover for the organizers to secure rope around it and bring it down. WHAT A WASTE OF MONEY… but I think people should DEMAND this money paid back! UNC is state funded, and that is Tax Dollars included, so as a tax payer of the state of NC, we deserve our money back! Meanwhile, Police stood guard over the pedestal and the fallen statue, while people in the crowd hugged and raised their cell phones to capture the moment. Next up, Charlottesville!” the protestors shouted. The call to remove Confederate monuments, viewed by many as symbols of white supremacy, has intensified since the deadly rally in Charlottesville, VA, one year ago, which was sparked by the potential removal of the Robert E. Lee statue in the city’s downtown (the statue is still there). Stephanie Chang, 21, a recent UNC graduate, said “It’s like, Silent Sam has been tucked in, put to bed,” by the time she had got to the protest she saw Silent Sam’s head on the ground. Soon, police were covering the statue with a tarp. Andrew Skinner, 23, who graduated from UNC earlier this year, said he was glad the statue fell in an illegal act. Patty Matos, a senior at UNC-Chapel Hill, said she left the protest less than hour before the statue came down because she was tired and sweaty, and it was going to rain at any moment. But then she got home, checked The Daily Tar Heel‘s Twitter, and there it was — on the ground. “This statue has been a constant reminder to Black and brown students of how academia wasn’t made for them; it was a physical manifestation of institutional racism and I’m so glad it’s gone,” Matos told Refinery29. Matos said she participated in a similar protest last year, but that this one was more organized. UNC released a statement Monday night. The question by late Monday was what will happen now that the statue has been torn off its base. It was face down in the mud as a late night thunderstorm passed through town. Police cordoned off the area around the statue with yellow crime scene tape. Eventually, the statue was loaded into a truck. The Southern Poverty Law Center says that as of June, at least 110 public symbols of the Confederacy have been removed in the U.S. since 2015, the year a white supremacist killed nine people in one of the country’s oldest Black churches. But the group said more than 1,740 still stand. So if there is one major removal per year… it’s going to be a LONG time before this issue is over. CONTACT UNC officials and the Chapel Hill PD immediately. If you are a UNC alumni, please let them know you will not be supporting the school until the vandals are arrested and the memorial is dealt with. PLEASE take the time to contact these folks and demand action, and forward this article to as many people as possible. For more information, email Ast. Chief Celisa Lehew at [email protected] or call 919-968-2834.